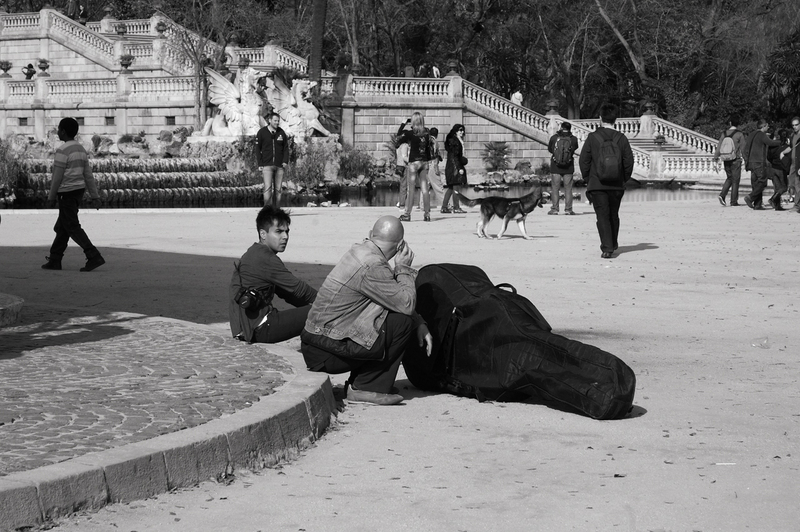 Waiting for someone, this girl decides to sit on the curb at the entrance to Parc de la Ciutadella, Barcelona. The dusk is near and her companion is nowhere in sight. From here on you can make up your own story. 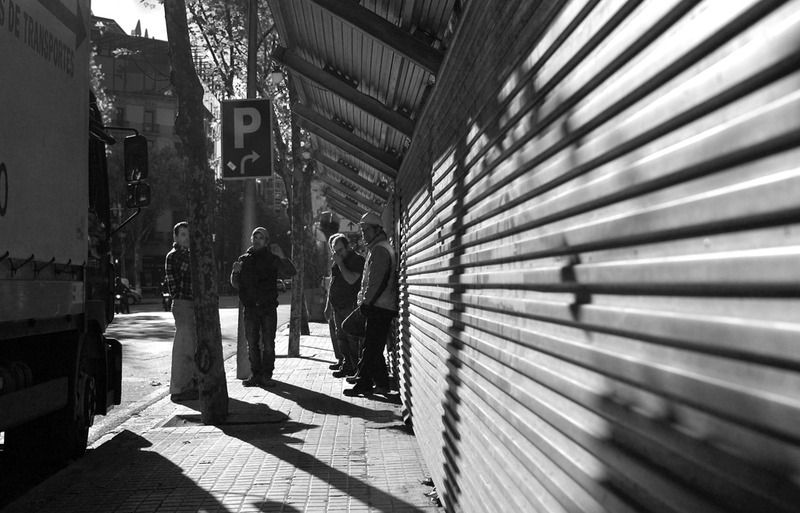 It is a well known cliche that in Spain from a group of say, five workers there is only one digging the hole while the rest is watching. I have to say that in part this is true although things are changing little by little. In working parties you always have categories, the foreman who is the most veteran and exempt from doing the hard work (he generally gives orders, inspects and at most, drives comfortably in a small bulldozer or a fork lift truck, the specialist, e.g a certified welder, well paid in general, and of course, concentrated in his delicate work and the laborer, el peón, that is, the one that digs the hole. And then, well, there can be some laborers watching other laborers while waiting for their turn to dig in shifts. But by any means, I want to say this is the general trend nowadays and of course laborers in Spain or abroad deserve all my respect because they are the motor of our economy and there is nothing more admiring that a worker. 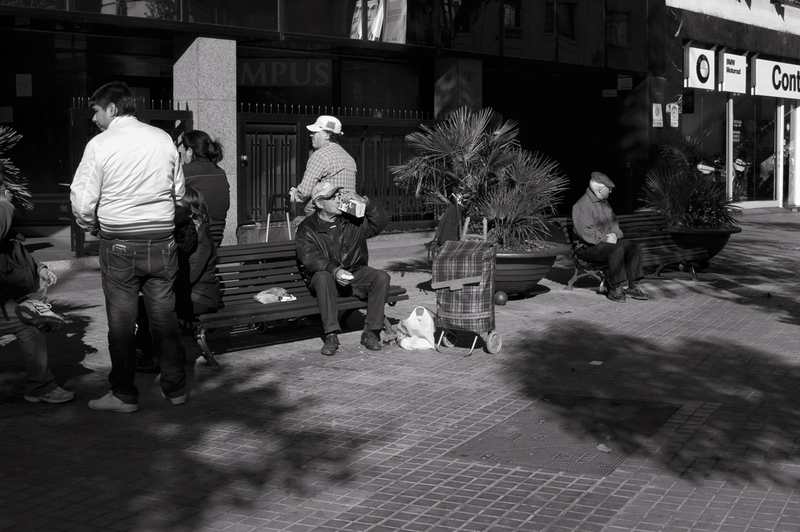 This image I took near Passeig de Gracia at the entrance to a construction site. Workers were obviously taken a break after a hard day's work. Man, you really ought to love music a lot to carry a beast like this, seems to be saying that fellow with the camera. In fact, the counter bass player was calling all the time in distress, perhaps waiting for someone to come a pick him up. It's no plan to go around the park looking for someone with this heavy load. I admire these people that are willing to sacrifice for the sake of music and their passion in life. As you see in street photography it is good that the picture tells a story. Unfortunately, this does not happen all the time when you shoot but it does help make the picture more meaningful. And of course, everybody sees a different story. That's wonderful. A man accompanies his bocadillo (sandwich made with rustic baguette bread) with some Spanish cheap wine in a Tetra Pak. Certainly, I wouldn't recommend it in those boxes no matter how popular they are, cause in general, they lack body and flavor. In Spain, the country of good wines, it is quite a contradiction that wine in Tetra Brik is so demanded. Don Simon, that also sells Sangria is by far the most popular. Remember to click on the image to see more details. 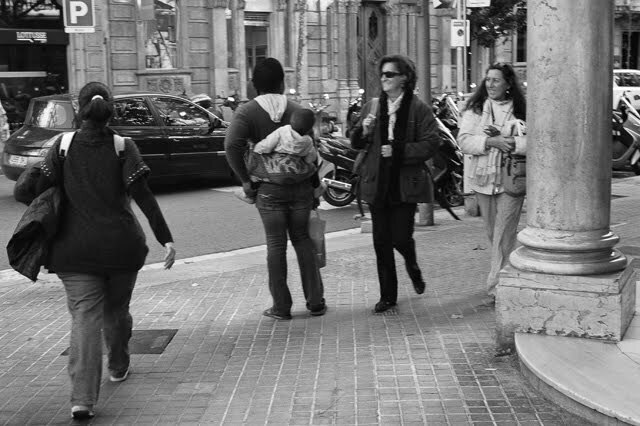 Baby greeting passersby from a rudimentary backpack. The woman was begging for money. 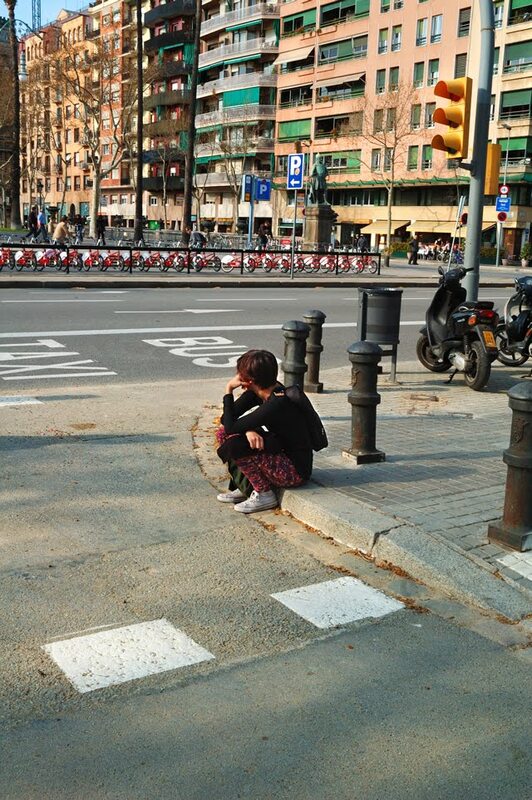 It happened near Rambla de Catalunya street in Barcelona. The image is blurry cause it was a snapshot and it got focused on the wrong stuff but I think the moment is worth showing. Just a little hope awaits on every corner, but too often expectations are not met. 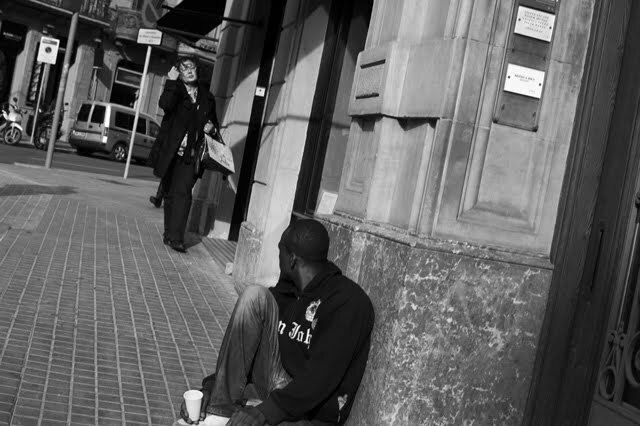 Taken from the hip on Rambla de Catalunya, Barcelona.